As we look back on our notes at our annual meeting, we’re proud of what we’ve accomplished. Our first project was Wunlang School, and now Wunlang is a destination for families seeking education and safety for their families. We have 890 students enrolled, and more than half are girls. Our high enrollment and retention rate is due in part to our providing menstrual supplies and underwear, and to the cash stipends paid by the British NGO Girls’ Education South Sudan. Because Wunlang School has a campus and is no longer a school under the trees, it qualifies for support from other institutions. Graduates of Wunlang School are attending secondary school in Aweil and are working, even with only a primary education, for International Rescue Committee. One of our first teachers is now the county administrator of education. Wunlang Clinic got very busy in the malaria season, which was very deadly this past year. One reason for this is the very high cost of anti-malaria medicine. One of next year’s goals is to research a reliable source of anti-malaria medicine, make a bulk purchase, and sell the medicine at a reasonable price. Promoting entrepreneurship has always been our model. Our Rhumathoi community center is doing well under new leadership. The previous leader is now working primarily for SunGate Solar. The Rhumathoi solar installation is functioning well and is now generating income for the center. The shop in Wanyjok is also contributing income from marketplace sales. SunGate Solar, now spun off as its own enterprise, continues to thrive with major support from one investor. The business now targets new suppliers and pay-as-you-go products as well as micro-grids in marketplaces. The whole story of SunGate is remarkable. Mou Riiny, who came to America as one of the Lost Boys of Sudan, lived with foster families, graduated from the University of San Diego with an electrical engineering degree, and through Village Help for South Sudan, supplied solar-powered battery packs to his home village in South Sudan as part of his senior project. The enterprise, while not yet profitable, is bringing in sufficient revenues from sales to pay a staff of 30 and its operating expenses. We have challenges to meet. We are still short of funds to bring clean water to Malual-Chum. (You can donate directly to that project here.) Our school in Thiou still needs a permanent roof repair. We want to continue providing supplies for girls and school lunches at Wunlang. You can make a difference and help us continue to supply education and opportunity to remote villages in South Sudan. Earlier this year we completed two solar energy installations. One is a large 6kW system at Thiou School, and the other is a 1.5kW installation at our multipurpose community center. 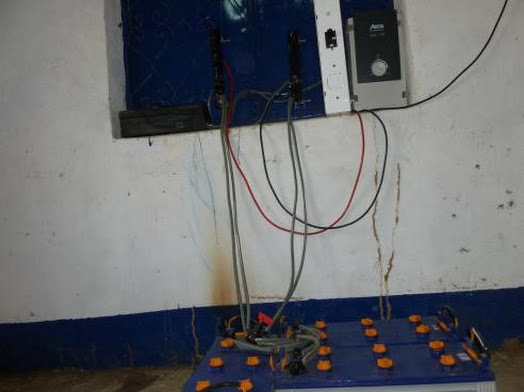 These energy solutions provide power for the facilities where they are installed, but they are also the base charging stations for our rural home electricity business. Proceeds from the business will help offset operations costs to maintain and run the facilities. The energy business is a pay-as-you-go model run by local operators we train. Customers in the area lease portable battery kits (PBKs) from the operators. 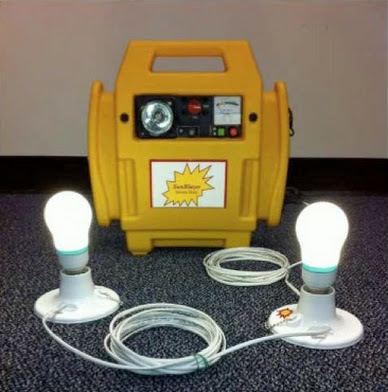 The kits include a rechargeable battery (12V, 18 amp-hour, deep cycle battery) and LED lights for their home. The PBKs also have built-in outlets for charging cell phones and other small electronic devices. The PBKs for the business arrived this week, and Mou Riiny has been busy with the 2 operators getting the batteries charged up and distributed to the initial customers. Each customer agrees to the conditions for leasing their PBK. Here one of the customers, a doctor from a nearby clinic, reads the agreement which specifies the amount he must pay each month to continue using the PBK. The customer signs the agreement before getting his PBK. Customers who cannot read or write are assisted by other family members. In rural South Sudan children who are in school will frequently use their literacy skills to assist their parents and other adults in the community who are illiterate. The PBK is small and portable, but very effective for the small amounts of electricity needed in rural homes in this area. The kit has internal electronics that prevent the battery from over-discharging, thus enabling a single battery to be recharged many times and to last up to 5 years. Each PBK comes with 3 LED lights for home use. This customer takes her LEDs to light her home and to help run a small home business at night. Each of our solar installations can support at least 80 PBK customers. For this initial pilot, however, each station has 25 customers. Our operators have been busy for the past several weeks learning about the business model, explaining the solution to others in the community, and finding their initial customers. Each operator has a waiting list of future customers beyond our current maximum. 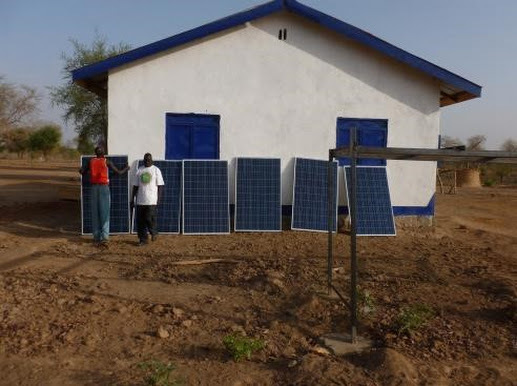 After piloting the solution with the first 50 customers, we hope to expand with more PBKs for the two solar installations and to install more solar generating stations to deliver the solution to other parts of rural South Sudan. Help us run this school! Help delivering moms and their babies! Help bring clean water to our villages! This World Refugee Day, we want to thank our executive director Franco Majok, and project managers Bol Thiik Riiny, Mou Riiny, and Manyang Malang, all who came to America as refugees and all who are now making a difference in their homeland. Keep up the good work, guys! 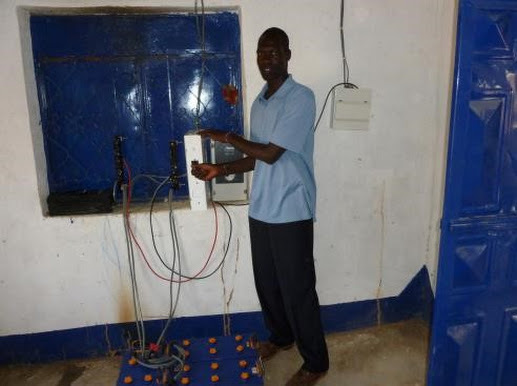 Mou Riiny, our Project Manager and Electrical Engineer, will present “South Sudan Rural Electrification Project” at IEEE’s 2013 Global Humanitarian Technology Conference (GHTC) in San Jose, California, in October. Mou’s presentation will be an informal overview of his solar electricity project and early results from the field pilot test sites. Here is a link to his abstract. The mission of Village Help for South Sudan is to support South Sudanese rural villagers in a variety of ways, and we devote nearly 100% of our budgets to enable local village groups to do their own development work. We enable villagers and former refugees like Mou to undertake projects and start businesses to employ South Sudanese to deliver goods and services needed by the local communities. Mou’s start-up enterprise, SunGate Solar, provides poor villagers with electricity they can afford. As SunGate scales over the next few years, many rural South Sudanese will be the direct beneficiaries of the electricity delivered as well as the training and jobs created to grow and sustain the business. IEEE is an important partner for SunGate Solar and our rural electrification program in South Sudan. Our pilot project tests an innovative model developed by their Community Solutions Initiative and initially deployed in Haiti. Attending the GHTC will be mutually beneficial as Mou learns about other science, engineering and technology solutions for disadvantaged communities and represents the needs and realities of deploying sustainable solutions in South Sudan.